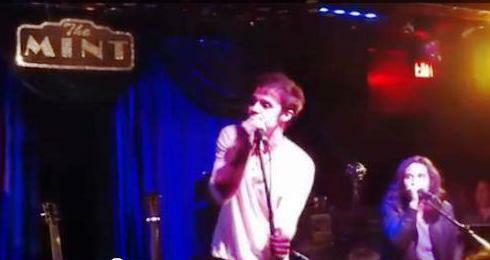 On February 9, Season 8 "American Idol" winner Kris Allen played a whopping eight songs from his forthcoming third album at Los Angeles's intimate Mint club, for a 200-capacity audience that included many diehard fans who'd traveled from out of state as well as Season 10 "Idol" alum James Durbin. "I missed you guys! This is great!" Kris told the shrieking audience, as he played his first full L.A. show since his secret Viper Room gig of April 2011. At the acoustic show, at which Kris was accompanied by regular bandmates Cale Mills and Chris Torres, fans went unsurprisingly nuts for the two familiar Kris Allen singles he played, the playful ditty "Alright With Me" and his biggest hit, "Live Like We're Dying." But it was obvious that they were there to hear NEW music (remember, Kris Allen came out more than two years ago! ), so when he started the show with the newbie "Monster" (not to be confused with any Gaga song, though he'd shockingly play some Lady Gaga later), the audience erupted like the tune was already a longtime setlist favorite. That energetic folk-rock number was a great start to the set, but I was personally even more impressed by a second new tune, the snappily syncopated, sweetly harmonized "Better With You," which even included a reggae-inflected rap breakdown that Kris pulled off with surprising panache. Come on, does this song sound like a hit or what? Next came the made-for-heavy-VH1-rotation new ballad "Out Alive" and the modernized yacht-rock of "Teach Me How Love Goes," along with some still-unreleased songs that have already become Kris concert staples: "Leave You Alone," "You Got A Way," and the countrybilly stomper "Shut That Door and Keep That Devil Out." Fans clapped along, hoedown-style, to the latter. Going into his next number, Kris joked, "Um, I know you guys have listened to some stuff recently," referring to recent leaks of his songs "Vision Of Love" and "My Weakness." He incredulously added, "How does this happen? I wake up to a bunch of texts telling me, 'Hey, I like your new song!' Well, at least you like it." While Kris and his bandmates didn't play "My Weakness," explaining that they hadn't prepared it and that they wanted to hold out so fans would come back to hear it at future gigs (as if these Kris devotees needed any incentive), they did do rumored new single "Vision Of Love." And people liked it indeed. Kris's piano rendition obviously sounded very different from the leaked dance-remix version that's floating around on the Interweb (yes, you read that right: a Kris Allen dance remix exists, and it's shockingly good), but the stripped-back "Vision" was still effervescent and uplifting. And it was obvious that a majority of spectators at the Mint were already very familiar with the song. Apparently Kris has more than one hit on that upcoming album of his. Keeping with a dance theme, Kris also trotted out a fun "girl-pop" medley of Rihanna's "We Found Love," Katy Perry's "Firework," and Lady Gaga's "Just Dance," which was a delightful reminder of his "Idol" days when he legendarily put his own earnest acoustic spin on Kanye West's "Heartless." Overall, he seemed confident and charismatic, very much in his element as he bantered with audience members (and handed them free bottled water; what a nice guy), and very happy to be back onstage. "It's nice to come from being in the studio and finally play for people," he declared. But the fans seemed even happier. Clearly Kris was missed, and his spring album release date can't come soon enough.